an American Staffordshire Terrier and his beloved son of 13yrs, may his sweet soul RIP. It was Frankie’s first time owning this breed, having only had Golden Retrievers, Labradors and a German Sheppard but Nitro was by far the smartest of them all. At not even 4 months, Nitro was trained with just hand commands and basic words but by the 5th month he was doing tricks, climbing trees, jumping over 6 ft walls and following everything and anything he was commanded to do. Frankie taught him to be friendly and non aggressive, to walk by his right side without a leash and to not cross the street without a hand gesture. He was well behaved off leash and Frankie never had to worry about him chasing after any dog, cat, squirrel, or other animal. Nitro was so trained to listen to Frankie’s commands that even when a friend of his tossed a steak into the street and told him to get it, Nitro didn’t budge until Frankie gave him the gesture. By the 7th month Nitro was being trained to guard and protect and knew a trigger word, “tijerras”, which means scissors in Spanish and was only to be used for defense. The story begins one night when Frankie, who worked with a professional drag racing team at the time, got back home to New York City from the NHRA circuit event in Texas and took Nitro out in his not so great neighborhood for a walk. Nitro was in the bushes taking care of business when out of the nowhere a man sneaks up behind Frankie with a gun to his back and tells him to give him all of his belongings. As Frankie reaches for his wallet, Nitro jumps out of the bushes and bites the man’s hand causing him to drop the gun. The man tries to grab the gun with his free hand so Frankie yells the trigger word “tijerras” and Nitro starts biting down harder as Frankie proceeds to kick the mugger. The man starts yelling and just a few minutes later a squad car pulls up. One of the neighbor’s must have called due to the screaming. The cop draws his gun out and says that he’s going to shoot the dog so Frankie stops kicking the man and commands Nitro to release him. Nitro releases the mugger and Frankie grabs him so the cop won’t shoot his dog. The cop is scared and asks where the leash is all the while the mugger is inching closer to where the gun was in the bushes. Frankie screams to the cop that the mugger is trying to reach for the gun he just tried to rob him with as another squad car pulls up. This time a woman cop draws her gun out and points it at Frankie screaming for him to get on the ground and release Nitro. Frankie doesn’t want Nitro to get shot so he lays on top of him covering him from open fire while the mugger gets cuffed. The cops then come over to Frankie wanting to detain him as well and still pointing their guns at him and Nitro. He explains what just transpired and after an id check they release him and tell him what a great dog he has and that he is brave for protecting his dog because had he not, Nitro would’ve been shot. Now Frankie is very good friends with those officers and it’s been over 9 years since that incident happened. Nitro has always left a great first impression with anyone that he has met. He saved Frankie’s life 3 times at gun point in NYC, he just wishes he could have returned the favor as cancer got the best of Nitro. Frankie misses him dearly as he is the son he never had. Nitro was honestly loved by many people in this country and has touched many hearts. Frankie knows he’s in a far better place now and is looking for places to take Frankie when they finally reunite. It is stories like this that truly show what great companions Pit Bulls can be. They love and protect you with their whole being. Please don’t judge the breed, judge the deed. Leash pulling is a common problem and can make a walk with your dog very unpleasant. Have you ever decided you would rather not walk your dog just because he pulls too much and you don't feel like being dragged? Don't give up just yet. Walks are an excellent way to exercise your dog and yourself. 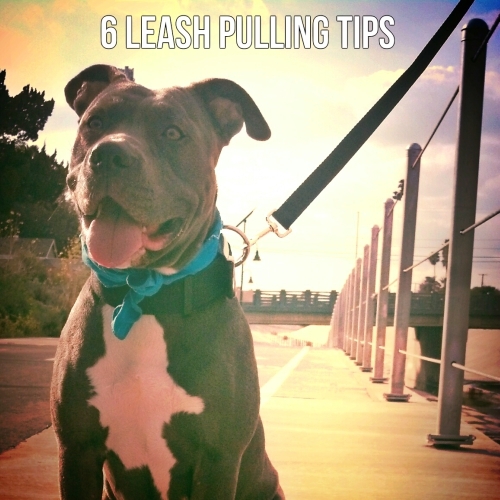 If you work on these following tips, you will be able to enjoy your dog walks. 1. Most dog gets very excited when they hear the word “walk” or see their leash. When this happens some dogs might even start shaking. Let your dog calm down a bit before even putting on his leash. 2. Once you notice your dog has calmed down and is in a sitting position, put the leash on. If your dog cannot sit still then you need to go back to basic training commands and teach him to sit and stay. 3. If you are having a really hard time calming your dog down you can try wearing him out a little before the walk. Throw a ball around to tire him out a bit. 4. Once out the door, if your dog starts pulling just stop walking. When your dog stops pulling and sits, you may start walking again. Every time your dog pulls, just stop and wait, then resume after he has stopped. This step is time consuming and requires patience but it will condition your dog. Even if your walk consists of you stopping every ten seconds, keep doing it. Your dog will learn that he doesn't command the walks, you do, and you will only go when you want to. 5. If you have problems getting your dog to stop you can use treats to get his attention. His focus must be on you, you are in charge. 6. Last but not least, praise your dog to reassure good behavior. Now get out there and enjoy some fresh air with your pooch. Pit Bull type breeds are included in every single breed restriction or ban that has been set in place by each region that has implemented a legislation, every single one! This ban affects dogs all around the world. These bans and restrictions around the world vary from region to region but the effect that it's having on these dogs is very real. Must not own, sell, harbor, breed, keep a Pit Bull type dog. Leash and or muzzle your dog when in public. Post "Beware of Dog" signs around your residence. Procure $100,000 US in liability insurance. Must surrender the dog to be euthanized if it has bitten a person or animal. Everyday, Pit Bulls are being killed due to legislation. In the areas where these dogs are illegal to have, there are many people that have no choice but to relocate their dogs within a certain time frame or give them up where they eventually are killed. Since it is already hard as it is to relocate Pit Bulls, the rise in deaths has grown drastically. These are dogs that have never harmed a thing in their lives and are gentle and loving and are being forced out of their homes to suffer an unjustifiable death with no where to go but shelters where they are put down. It's a Holocaust of sorts and is completely unfair to loving dogs and owners alike, who both feel the impact. The ban affects home owners and renters alike because insurance companies see these breeds as a liability and will not allow them on their properties, making finding a residence extremely hard for owners that do not wish to give up their dogs. There is a fear of these breeds now and this causes people to cast judgment solely based upon a false sense of fear. The truth is that dogs sometimes attack people,, not just a specific breed or breeds, but the species as a whole. By banning and killing off dogs solely based off of appearance, we are endorsing and showing that stereotyping is okay and should be enforced. It is showing that every dog that looks a certain way is exactly the same. This is so wrong on so many levels. Instead of killing off dogs that belong to a responsible owner why not punish owners who are irresponsible. Why should the actions of the few affect the masses so dramatically? Banning these breeds, instead of implementing new laws that target irresponsible owners and dogs that actually are dangerous, is not working. These dogs are now being bred by people who just want to make a profit based on their desirability, who in fact, are worsening the breeds. These dogs are being bred in mills and with no concern for good temperaments, genes, and health problems, which is causing more stereotyping to happen. What should be done instead of banning the breeds, is enforcing proper breeding practices and responsible dog ownership. The fight to end BSL is one that will take the efforts of every person that cares about these dogs. If we don't stand up for them no one will and then what? Let them die, suffer, and soon be banned everywhere causing the extinction of many breeds? Ending BSL starts with you. Educating yourself and others and being a responsible dog owner is just the beginning to a long road of changing the view about Pit Bulls and Pit Bull type breed. So will you join in on the fight?